So it’s been a little over a month and I think it’s time to let out how I really feel about this little car. Let’s get some things straight, the Lima 4 (stock anyway)is not going to be winning any races, passing any cars, or impressing any girls (only the good ones appreciate not walking anyway). You should not be forcing this engine to carry the maximum amount of people in this little car... Regardless a commuter who enjoys driving, 88 horsepower is more than enough to safely motivate this car. The cars redeeming qualities if you’re still not impressed at it’s powerplant is that fact that LX 5.0/GT bit’s bolt right on with no major modifications. You can easily make that Slo-stang a trackday corner whore. I get mixed reactions when I parade this thing around, some days I’m getting thumbs up from the muscle car guys when I’m hanging out in the parking lot or when it’s being introduced people have to warm up to the thought that this design wears an iconic name and that’s OK ! Personally other than it being a fun little runabout it’s not any special than a civic of the same vintage, it’s 4-Speed is it’s saving grace from what I’ve heard about the Automatic foxes. A car like this has to really be owned by someone who appreciates it for what it is. I’m not a Tuner, I’m an enthusiast, an entry level grease monkey who needs to get to school. A 5.0 would be nice every now and then, but it’s not polite enough for my taste, but just wait till I get my hands on a 2.3 Turbo set up. I still have work to do on it before I can with a good mind use it to completely replace the Crown Vic as my new daily. I have a new clutch on the couch and a new flywheel in the mail, some better seat belts in the trunk and maybe a brake upgrade. 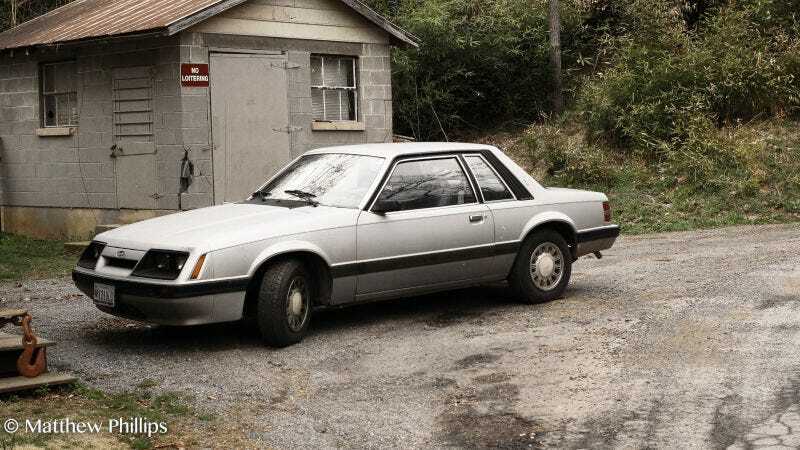 I recommend a Slo-fox for someone just getting into car culture. Lot’s of bolt-ons. It doesn’t become a daily beater it becomes a friend, very responsive and it tells you everything. And on that nice patch of road, you roll the windows down, tur up the vintage sounding radio and cruise it out.